Sometimes doing these movie reviews are painful. Of course, my friend Darin would say that it is my own fault, and he would be right. I choose to do this, and I chose to go to the new recasted, rebooted Diary of a Wimpy Kid: The Long Haul film despite not seeing one piece of advertising that would make me believe that it was going to be worth my time. And yet, I had been surprised by the original films in the Diary series. They were far from great, but they were mindless entertainment, a guilty pleasure, almost. Could the brand new Wimpy Kid catch the same… I hesitate to say magic… how about…energy, as the last few did? As I sat in the theater before the movie started, I began to get a feeling of dread in my gut. A feeling that really created an uneasiness inside me. I thought about getting up and heading home, but I persevered. I had very negative feeling heading into the film, but it couldn’t be that bad, could it? About ten minutes into The Long Haul, I realized that it absolutely could be that bad… and perhaps even worse. I almost left several times during this road trip movie, where the newly minted actors (led by Alicia Silverstone- who, of course, is in one of the worst films ever made with batman and Robin) started their summer vacation driving for several days to get to Meemaw’s house for her birthday party. Susan (Silverstone) had planned the trip as a way to help bond the family together, but clearly that would be prevented by hijinks. Several hijinks including the basic gross-out far, puke and poop jokes that appeal to those with a sense of humor of a 6 year old. Greg Heffley (Jason Drucker) is the titular Wimpy Kid and he becomes an internet meme and goes viral on YouTube when he gets his hand stuck in a diaper. Yes, he got his hand stuck in a diaper. In hopes of living this down, Greg plots to attend a gamer convention in Indianapolis with Gamer sensation Mac Digby and get in a video with him. Nothing could go wrong with that plan. 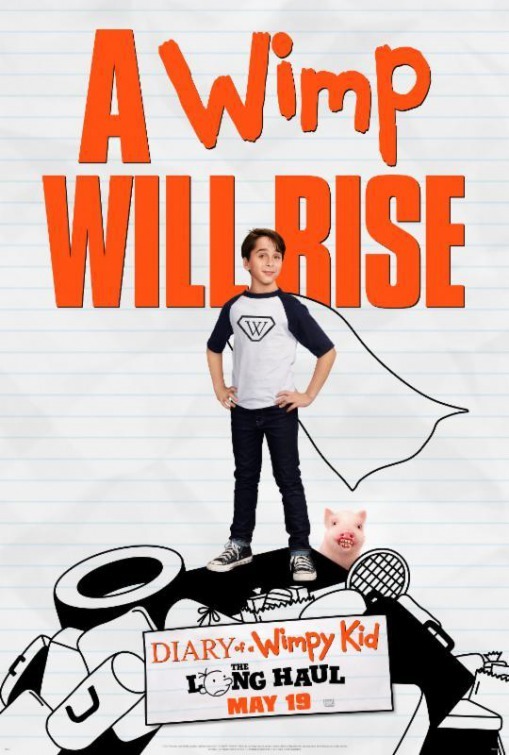 Plot holes and coincidences abound as the movie goes out of its way to show the absolutely worst traits of humanity, not only in the Heffley clan, but the crew of locals and bystanders that they encounter along the way. The film seems ready to insult just about anyone for a cheap laugh (laugh being a strong word). To be fair, Jason Drucker does a decent job of playing Greg and carrying the weight of the film, but what he was given to do was so inane and so stupid that it didn’t matter that the boy had some talent. In fact, the new cast was far from the problem. Even the constantly ignorant and annoying Roderick (Charlie Wright), the most cliched of stupid characters, was not the main difficulty in this epic flop. Diary of A Wimpy Kid: The Long Haul simply put is so insulting stupid that it cannot overcome the weaknesses even though the new cast is reasonably decent. This movie is not about the cast of characters or the actors. It is about throwing them into gross-out situation after gross-out situation and placing them in such an unbelievably dumb plot contrivance that we stop caring before we are even a quarter of the way to Meemaw’s house. I almost left this atrocity several times, but I held out for the end. I couldn’t miss that emotional reunion between a boy and his pig. If you have yet to reach double digits in your age, you may enjoy some of the “jokes” in Diary of A Wimpy Kid: The Long Haul, because they have been written for you. For the poor parents who have to attend this film along with said children… I feel your pain. This is one of, if not, the worst movies of 2017 so far. Please think about that before we redo a movie film series again. Same. I would give this movie a 0.00000000000000000000000000000000000000000001. On my blog, HuckSTARcritic, I wrote a review on this movie too.